The font size can be changed from size 6 to 150. The font color can be also be changed, see Using colors for additional information. 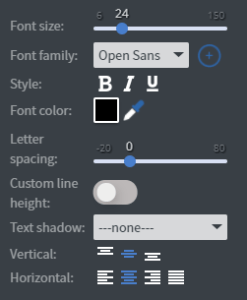 You can set the letter spacing from -20 to 80, as well as a custom line height. Text shadow will give you a variety of options of adjusting your text shadow. Lastly you can adjust the vertical and horizontal alignment of your text.